Please respect my rights as designer: do not sell, share, translate, or publish any parts of my patterns (including pictures) online or elsewhere without my permission. Do not claim this pattern as your own. Feel free to sell the finished items you’ve made from my pattern! If you do, a link-back to my blog www.made-in-k-town.blogspot.de would be great. Thank you! As usual, I used small amounts of Catania by Schachenmayer and a 2.5mm hook. My mandala measures 12cm in diameter (4.7") but the size will vary depending on the yarn you use. 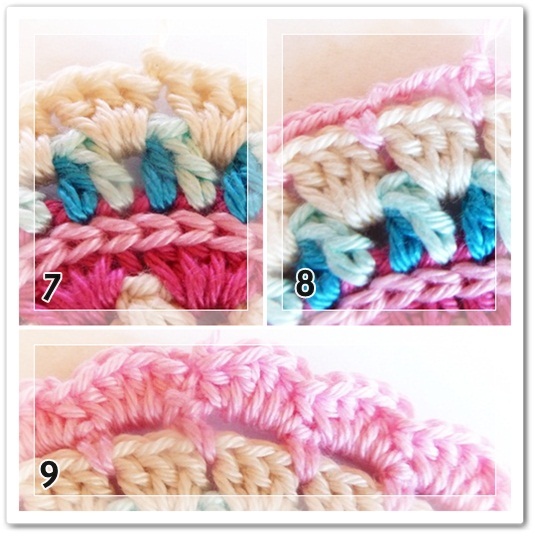 For this pattern I use US crochet terms. We’ll need the following stitches: chain stitch (ch), slip stitch (sl st), single crochet (sc), half double crochet (hdc), double crochet (dc), double crochet three together (dc3tog), and surface stitches. The dc3tog and the surface stitches are explained below, please use the pictures as a help, too. I did NOT write down the chains at the beginning of each round: for the first stitch in every round, work chains (e.g. 3 chains for the first dc) OR start with a “standing stitch” i.e. join the new color with a slip knot or a simple loop ON YOUR HOOK and just work the first sc or dc as usual. Join rounds with a sl st. Here's how you do the dc3tog: yo, insert hook into ch2-space and pull up a loop, yo and pull through 2 loops (2 loops on hook), yo, insert hook into the same ch2-space and pull up a loop, yo and pull through 2 loops (3 loops on hook), yo, insert hook into the same ch2-space and pull up a loop, yo and pull through 2 loops (4 loops on hook), yo and pull through all 4 loops on hook. (Note: to start the round, either make ch3 and then a dc2tog, or start with a standing stitch and work the dc3tog right away). For the surface stitches, hold the yarn at the back of your work, insert hook in between any two dc’s, yo, pull loop through the gap. Now you’ve got a loose loop on your hook (hold the end of your yarn tight for the first stitch!). *Insert hook in between the next two dc’s, yo, pull loop through the gap and through the loop on your hook*. It’s like working slip stitches. Work this way around, then insert your hook in the first gap where you started, cut thread, yo, pull thread through the gap and through your loop and finish off. Use your hook or a needle to pull the loose end through to the back again, tie the two ends together and weave them in. 8th Round (new color): work (1sc, ch4) between every 3dc-group. 9th Round (same color): work (1hdc, 3dc, 1hdc) in every ch4-space. Finish off, and weave in all the loose ends. I hope you enjoy making this Spring Mandala! If you've got any questions, or find errors in this pattern, please let me know! Want to see more Little Spring Mandalas? Check out the Project Gallery on Ravelry! Very pretty and such a clear tutorial! Good job, Barbara! very springy mandala, going to try it out right away! I like the colours, very nice. Thanks for sharing this beautiful pattern. Das gefällt mir sehr gut. Werde es direkt nachhäkeln. Wirklich ein wunderschönes Mandala und ich drucke gerade aus zum nacharbeiten. Mal sehen, was für Farben ich so finde. Thank you for the easy pattern! I finished my Mandala! I Liked it! Dankeschön, ein super tolles Mandala! I very much like your combination of colours it gives it a subtle look...very nice. I've also been looking at your crocheted stones....I've done a few in the past but using fine cotton but it does make it slower to complete so I think I'll try with a thicker yarn as I see yours have turned out very neat indeed. I love this! So cute. Very well done! I've been wanting to crochet something just like this, thanks so much for the tutorial! Would love to see you on Craft Schooling Sunday, do drop by! and I'll be sure to link back to you when I post something I've made with your pattern, all the best! Lovely pattern, Barbara, and the colors are delightful! Thanks for sharing. PRECIOSA!!!! ME ENCANTA EL COLOR. Oh my, I can't wait to try this! I love this, it's beautiful! Thanks for posting it. :) A question - I would love to turn this into a rug. Could I just continue the pattern and make the mandala very big to do so? Hi Barbara, I've just thought of another question - do you (or anyone else who's reading for that matter) know how I could upsize the pattern into a reasonably big floor rug? I'm guessing the yarn you used wouldn't be thick enough? If not, do you know of any yarns using the same colours as yours which I could use? That really IS beautiful! I'm gonna try this, thankk's for pattern and tutorial! Thank you so much!!! This is incredible. Very pretty! I found you through Pinterest. I think this mandala would make the perfect ends a bolster cover. I can't wait to try! what a great idea! I think I might try that as well! What a cute mandala. I love its meaning of whole. In Chinese culture, we like circles too I believe b/c it means unity. that is absolutely stunning! I found your post through My Creative Space today. Soooo inspiring...thank you ! So pretty Barbara - I'm getting my hook out right now! Thank you for sharing. This is so pretty, Barbara. And it is crochet - which I can do ... as opposed to knitting, which I cannot do! I'm Pinning this for a future project. Thanks for sharing. Thanks for the pattern, will sure give it a try! Hi there, my name is Charlien Richter, and I live in South Africa, I just stumbled across your blog and I like it very much. Thank you for the lovely pattern. Vraiment adorable ! Les couleurs vont très bien ensemble. I've already visited you at the Coconut Lounge, Ri :) Thanks for sharing your pretty version! Ciao ! I love your tutorial, thank you ! I shared it on pinterest hoping you don't mind ! Wow! What a beautiful site you have. 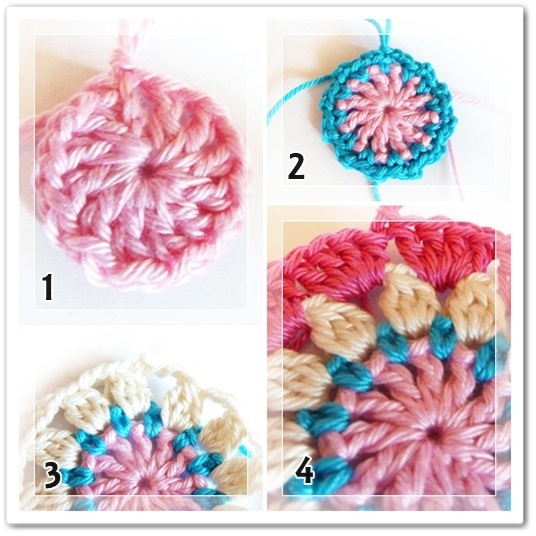 Love the soft colors of this mandala and your tutorial is so clear. Lovely indeed! I love the pattern and colors! But what do you do with a Mandala or Mandala's? Hi Kelli! Honestly, I really don't know what to do with it, I just enjoy making them :) I've made a similar mandala, added more rounds and turned it into a cover for a stool (you can find that post here on my blog). I also like the idea of using the mandalas as ends for a bolster cover (a suggestion by "cherishables" further above). So pretty!! I featured your pattern on today's Link Your Stuff. I hope you have the chance to stop by today. Thank you Annemarie! I love your link-party, and I feel very honoured that you've featured my pattern, when there are so many awesome links shared every week! Hugs, and have a great week-end! For some reason it won't let me post comments? I was wondering if you think Caron Simply Soft yarn would be ok to use with this project? Prachtig van kleur steek en resultaat. ik heb er een heerlijke strandtas van gemaakt. What a lovely pattern! I've made the little mandala and I made a bigger one all by myself! You can see it on: http://ellebel5.blogspot.nl/2012/06/gehaakte-onderzetter.html. Thank you Ellen, this is awesome!! Bedankt voor het delen van dit mooie patroon. Hi Barbara, I just spent a lovely few hours doing this pattern. I just posted it on my blog & linked it back to you. Hi Barbara, your mandala pattern is stunning and I can't wait to make one!!! I have so many ideas in my head for things I could do with it. My husband has taken our children away for the night so I have the whole day to play with my crochet hook (while ignoring the housework!) - so thank you for the wonderful inspiration!! I love, love, love this pattern. I worked up one for my daughter. Your directions were super easy to follow and the end result is beautiful! Thank you so much for sharing!!! 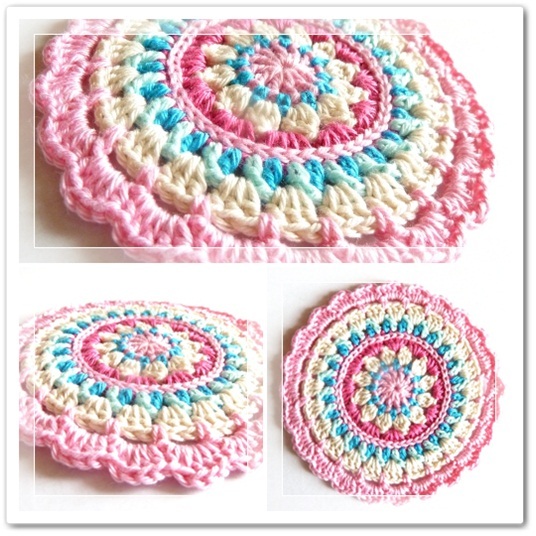 I've made 2 mandala's en blogged about them. As already everyone gave the same comments, I'm just going to add another one. Thank you for this lovely pattern. Really very nice. I've found your excellent instructions for making the beautiful multi-colored mandala via Karin's post. It is grand to see your posts. I don't have flickr to share the photo of my mandala, but it worked out great! It started to cup at round 4, but after chrocheting a bit looser it was flat. I'm thinking of making a summer beach-bag with this pattern, I love it! 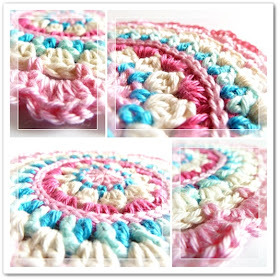 Hi Barbara, i love this pattern of crochet circle, the colors are beautiful.. I have my tutorials blog , if your kind please grab my button..
Очень красивая мандала! Обязательно попробую связать такую! Love this pattern. Would you please contact me at butterflycrochet at gmail.com as I have a question for you that needs to be done off post. cela fait une belle petite balle pour un bébé. 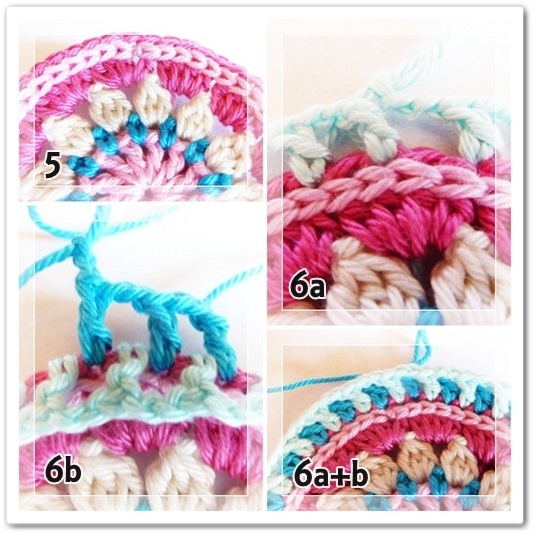 Thanks for this very helpful tutorial, and happy crocheting! I listed my first spring mandala on flickr. I really thank you for your pattern. Thank you so much for sharing this pattern. I have been wanting to make one of these. It is so beautiful. Thanks so much!!! Another use for this beautiful pattern: http://www.ravelry.com/patterns/library/sea-turtle-rug. Thank you so much for allowing me to use the mandala as the centerpiece for the shell! Thanks for your beautiful patten. I have made it and made à Poef of it? Hi, I love this pattern and I've shared it a few times in my Facebook page. I have many spanish speaking followers that ask me if I have the Spanish version of it. I'd love to translate it into Spanish if you agree, and I can send it back to you so you can publish it in that language too. 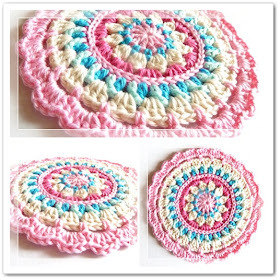 This mandala pattern is so beautiful - I used it for the basis of a stool cover I gave my daughter for Christmas. I recently blogged about the stool cover and linked back to your pattern in the post. Here is the post. http://flythecoopcrafts.blogspot.com/2012/12/a-crochet-christmas.html Thank you for your talent and your willingness to share freely your creatiions. Just beautiful...love your color choice! Your color looks so beautiful. I tried and put it in my blog. Hi! Thanks a lot for the pattern! I had a lot of fun making these mandala's! This is simply beautiful! Thank you! just pinned this! Got you from Howling at the Moon: Easter Doily thru the Someday Crafts link up. Thanks for this gorgeous pattern, I've just finished it in green and white and it looks great!! hi i love this pattern. could you please let me know how i tell when i am to start a new row with a chain, or just do the simple continuing to crochet instead of making the chain? thanks so much! Barbara, hello!!!!! I've come to your beautiful blog by way of Heather at The Patchwork Heart. I was admiring her coasters and she told me I could find the pattern here. They are beyond beautiful, I am so inspired and impressed!!!!!!!!!! Hi Barbara, thank you for sharing this beautiful pattern. Thank you for sharing this beautiful mandala pattern. I have just used it and posted it on my blog, I think it looks lovely. All your patterns are beatiful. I'm glad I found your blog. When I lived in Germany I also lived in K-town. K-Town is this case stood for Kaiserslautern. I hope one day I can go back for a visit. I LOVE this mandala pattern. I've "pinned" mine on Pinterest and uploaded on Ravelry. Any ideas how to square off the edges of this mandala? I'd love to make an afghan but am not having much luck on my own with this challenge! This is such a great pattern. I've included it in the Crochet At Play database. I hope it brings you lots of visitors. We have over 25,000 free crochet patterns available in the databse, if you have others you would like to include you can visit the submit page at www.crochetatplay.com to make sure we include them. I made a few! I used crochet thread in only two colors, and it went really well! I managed to not have to cut/weave because I alternated only two colors and could drop/pickup the colors after each row. My hands are sore, though. Dear Barbara! Thanks for the pattern! hi I like very much your pattern/ I tried and it came out very nice/ may i translate it to Hebrew ? of course with a link to your blog. Glad to hear you like my pattern! Yes, with a link-back to my blog I'd be happy if you translated my pattern to Hebrew! Thank you for the mandala pattern. I made in other colours, like your colours too! Thank you for the pattern! I love this motif, very pretty! Barbara, Thank You so much for sharing your pattern!! So many possibilities with this pattern. Saved for future project - very nice! Imagine my surprise when I saw your name as that was my maiden name! If you are a Barbara Jean...too weird! Happy hooking! This is beautiful. I hope its OK that I have posted a link to this on a crochet group on Facebook. Thank you for sharing. Hi Barbara, thank you for sharing this lovely pattern ;). I did my own version for Yarndale's mandala project. Take a look! These are just beautiful, I saw them on Pinterest, I might have to learn to crochet! Thank you so much for a brilliant tutorial! Thank you for your pattern with the photo-explanation! I have made a colorfull mandela and I have linked to this page on our site (in dutch http://www.breigaren-denbosch.nl/assortiment/katoen/ ). Thanks again and greetings! We have just included you gorgeous work in our Mandala Madness pattern round-up! Beautiful work! I think this is my favourite mandala so far. The pattern is very good, thanks for sharing Barbara! Aerobatics! This is very beautiful ! Thank you ! This is a lovely pattern & fun to do. When completed the last row curled up, what did I do wrong? Hi Im Susan MJ I read it and do you mean 1 hdc, 3 dc, 1 hdc . Or edging ?? Count hdc & dc you may have left some out. same with edging ( I did'nt read edging. this is beautiful but i am having trouble figuring out the round 5 and just what your talking about . Could you please message me and tell me in different directions on how to accomplish round 5? Was lookimg for a pretty one like this since long. THAAAAANKKSS. Just finished making your mandala and it turned out beautiful!! Thank you so much for sharing. You did a wonderful job with instructions and pictures! Hi Barbara. I translated your tutorial in german. I hope its okay? Hi, Barbara, I will translated your tutorial in Indonesia language and use it for a crochet gathering to collect used books for unprivileged children in Indonesia. This is kind like a gathering for charity. So, I hope you give me permission. The gathering will will be held on Sunday, November 15, 2015 in Jakarta. Thank you. Thank you so much for sharing your pattern. I can't wait to try making one. Thank you for sharing this pattern and tutorial. I've made a couple and I need to keep practicing to get better at changing colors. I really love them and plan to give them as gifts. I want to thank you for this pattern. I have wanted to make one for so long. I found your pattern so helpful and easy to read/follow. I have been really stressed and sad because it seems that I'm not doing well making things lately; lots of frogging, nothing getting finished. Making t,his made me happy and less depressed. Thank you again! Love this pattern! Great directions too! i love making mandalas......thanks for this beautiful pattern....cant wait to try it out!!!! Thank you for this easy to follow, clearly written pattern - I loved making this for my friend's Mom. I made it in a couple of different colour patterns and it looks so different depending on where you change the colours.